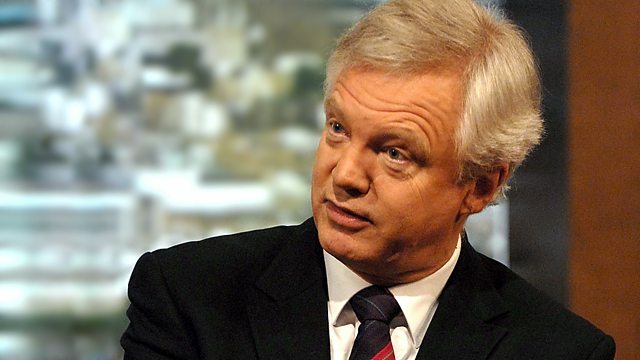 Kirsty Young's castaway this week is the Conservative politician David Davis. Born just before Christmas in 1948 to a single mother he was brought up in poverty in first York and then London. He says that he learnt early on the importance of not running away from a challenge and his grandfather and step-father taught him how to face up to his own fears. He went on to join the SAS through the territorial army and, during his career at Westminster, has earned the nicknames 'Bone Crusher' and 'Bovver Boy'. Yet he shocked his own party when, in June last summer, he stood down as Shadow Home Secretary and announced he was going to campaign against what he saw as a fundamental assault by the government on our civil liberties. In this personal interview, he describes the anxieties that beset him as he made that decision - and the extent to which his political life changed as a result of it. Luxury: A magic wine cellar which never runs out. Verdi/Puccini: Arias: Kiri Te Kanawa.